Seeing little dark things on your saddles, especially when all the feathers are falling out, can be scary- especially if it’s a nice, new saddle with pretty coloration that you haven’t even used yet. I got out my magnifying lenses that I use for tying, and inspected the little dark things. They were somewhat squishy, a dark reddish brown, and didn’t appear to be bugs. Fungus? Random bacterial infection? Some other horrendous bad thing that I haven’t heard of yet? I had *just* washed the saddle, and during rinsing, the feathers started falling out. That led me to give the saddle a closer inspection. Wayne Luallen had just given a great class on how to clean your tying materials, and I was in the middle of washing ALL my items to make sure they’re pleasant to work with. I haven’t even been tying flies for a year, and I’m grabbing as much information as I can to get a solid foundation for tying. If I don’t learn bad habits, I won’t have to get rid of them later, right? In a panic, I quickly sent an email to Wayne, with pictures, describing what was going on. What you are seeing appears to me to be the base of a feather that has not developed a quill yet. It is still a “pin feather” which is an immature feather. You may have been in the kitchen when I passed around the Whiting Saddles I had cleaned. The back of the skins showed black spots where the quill should be. Those are indication of feathers still growing. A sheath of material (epidermal tissue), rather chitinous-like, will encircle the barbs and rachis most often at the base of the feather, but can also be found up the shaft while the feather is still maturing. If found up the rachis a bit you can slide it up and off as a tube. 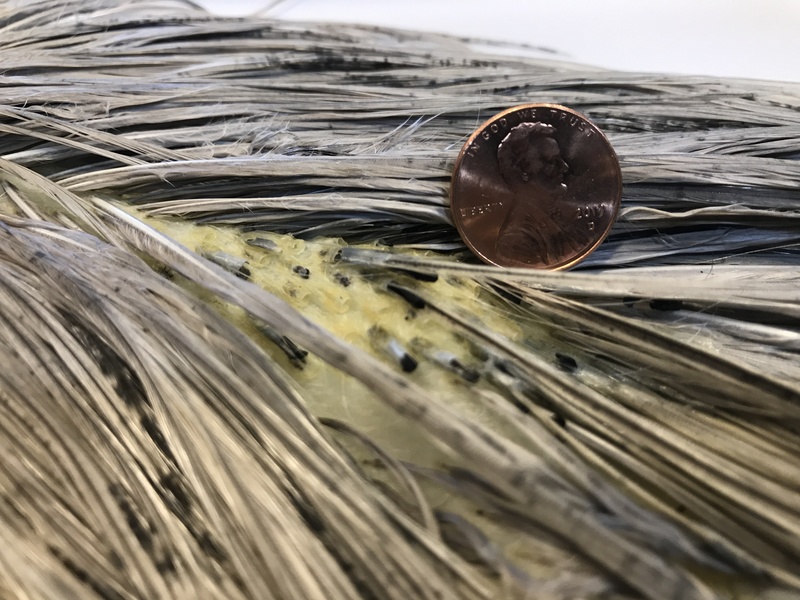 So, bottom line, you have feathers that have not yet reached full growth in length, which fits all of the Whiting and Hebert line of Saddle feathers. Tom Whiting has hybridized these particular lines to never fully mature. Your feathers may be from his birds, or perhaps another source that harvested prior to full feather maturity. — No concern that this is insects or detrimental to your feathers in any way. And the reason they fall out is that there is no quill to securely lock them into the follicle, especially when you do something to loosen them such as soaking in soapy water. That’s why I mentioned to be careful scraping and washing Whiting saddles. Capes are not a concern because nearly all cape feathers will be mature with developed quills. Those that are not can be easily spotted, especially after scraping, as black spots on the back of the skin. I dug a bit deeper and found in Wikipedia: Pin feathers begin to develop after the feather bud invaginates a cylinder of epidermal tissue around the base of the dermal papilla, forming the feather follicle. At the base of the feather follicle, epithelial cells proliferate to grow the epidermal collar or cylinder. As the epidermal cylinder extends through dermis, it differentiates into a protective peripheral sheath, longitudinal barb ridges, and growth plates. Over time these barb ridges lengthen helically, branch to create barbs and barbules, and fuse to form the rachis or central shaft. Moreover, the barb plate further differentiate into hooklets and cilia, while the marginal and axial plate die to form the intervening space within the feather structure. Whew! Okay! Much to my relief, my feathers weren’t tainted with some unknown beastie that would devour the rest of my stash! They were just immature feathers. Pleased that I wasn’t going to lose this lovely light blue dun saddle, I set it up to completely dry, and then sealed it away in a nice zip baggie for when I get a chance to use it.